How to Perfect your Gift Face! 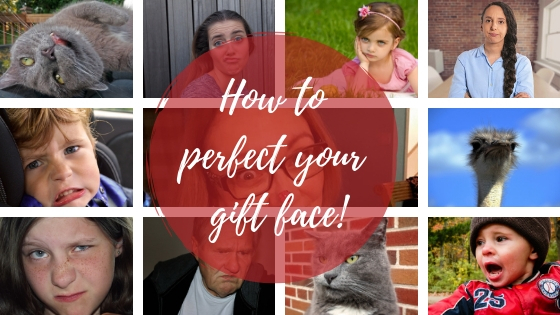 In this blog piece we tell you how to train your face to not show the disappointment when you receive a really bad gift, how to perfect your gift face. You know that feeling, when you are presented with this surprise gift and as you peel back the wrapping in anticipation of a wonderful surprise and ‘Ah Oh’ it’s really crap. The bubble bath that you are allergic to, the scarf that your mother might have worn back in the 80’s, the gift that you would expect to win in one of those arcade claw games. How do you control your face if you are not an Oscar winning actor? The overwhelming urge to burst into laughter or a massive grimace right in front of their face is just too much. I learnt very quickly thanks to one son who took a while to learn not to be brutally honest to people. If an older lady would come up to him to say hello, he would just look at them and say, ‘you’re really old’ so you can image what sort of thing he would say when he was handed a gift that he did not like. We soon realised we were to never let him open a present in front of someone unless we knew he would like the contents until we trained him up. Here are some training exercises to practice. Look in front of a mirror, and watch your face. Do your lips have a habit of tweaking at the side when you think of something funny? Listen to your favourite podcast that would normally have you in fits of laughter while you look in front of the mirror. Fight every urge you have to not twitch or burst into laughter. Challenge your friends to a game of You Laugh, You Loose. For those that don’t know the game you sit opposite your opponent and tell jokes in turns, the first person to laugh, snigger or snort is the looser. When you open a present, imagine you have your mouth full of water so you have to keep it still so you don’t spurt it out. Look in the mirror and repeat sentences like ‘Why thank you, it’s a lovely gift’ and ‘You are so kind to think of me’ without sniggering, no, you don’t have to do it in a Professor Henry Higgins voice. It is only with our very closest of friends could we get away with asking if they still have the receipt for a gift and know we will not be causing offense, the best way to get round to getting a receipt is if it an item of clothing tell them they flatter you, unfortunately it’s a little too tight, you could please perhaps have the receipt so you can exchange it for the right size. You are totally stuffed if its an accessory or other non-size related gift. Guess you are off the charity shop with that one! If you feel you cannot hide your emotions then its time to employ devious tactics. In a group you can generally get away with the ‘it is impolite to open gifts in front of everyone’. One to one, you go for the ‘oh bless you, but first, more importantly you must tell me how you are’ and hope that they do not realise that you have yet to open their gift. Finally, and this is obviously the best tactic of all, tell them about this wonderful website called Crimson Tiger, and how it allows you to create a wish list like the one you have just so happened to have created! You never know next year, you might not need to work for your Oscar winning gift face.